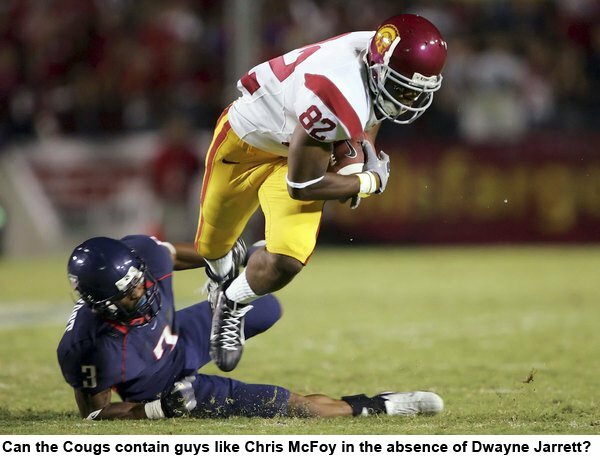 Hangin' With The Nuss: Saturday Preview: Cougs will come close against USC, Huskies 2-0? Saturday Preview: Cougs will come close against USC, Huskies 2-0? How we got here: The Cougs' season continues to move ahead according to form after a 36-10 thrashing of Stanford last week that wasn't even that close. WSU rolled up 238 yards on the ground against the Cardinal, moving the Cougars up to No. 2 in the Pac-10 in rushing at 189.8 yards per game. That rushing game is what has driven WSU so far, using a three-headed attack to keep defenses off balance. Sophomore DeMaundray Woolridge still leads the team with 211 yards (5.6 yards per carry), but redshirt freshman Dwight Tardy is right on his heels with 205 yards (4.9 yards per carry). Transfer Darrell Hutsona has been a great change of pace, reminiscent of Jerome Harrison in his first season. The defense has been spectacular at times, albeit against weaker competition than USC, including Mkristo Bruce's five sacks last weekend. The Cougars' secondary -- the major weakness of the team last year -- has comported itself surprisingly well so far, ranking second in the league in pass defense efficiency. Meanwhile, USC continues to prove that Trojans don't rebuild, they just reload. Many questioned how Southern Cal would cope with the loss of 11 players drafted by the NFL, including Matt Leinart, Reggie Bush and LenDale White. Well, the answer is very well, thank you. Playing two of their first three games on the road, the Trojans have yet to really be tested. It was close through most of the first three quarters last week against Arizona, but the Wildcats never showed enough offensive gumption to make you believe that they actually could pull off the upset. John David Booty is showing why he was so highly recruited in the first place, although his 6.34 yards per attempt is below what you would expect out of what is supposed to be a big-play offense. Key matchup: I think WSU will be able to score some points, although the rushing attack will not roll the way it has the past three weeks. And I think the Cougs' front seven is good enough to contain the Trojan rushing attack. The real test will be if this defensive secondary truly is improved, or if it's a mirage created by playing Idaho (a run-oriented team for the time being), Baylor (a spread offense mostly looking for five-yard dump-offs), and Stanford (a team down pretty much to walk-ons at wide receiver). All indications are that Dwayne Jarrett won't play, so that will be a boost to the Cougs. If they can continue to stay away from giving up the big plays that plagued them last year, they've got a shot at the upset. Prediction: Even without Jarrett, USC will get its points. Although the Cougs will be able to keep it close, I look for a couple of key mistakes -- a fumble, a Brink interception, or a big pass play on defense -- to be the difference. It will feel like WSU is in it the whole way, but just can't do enough to get over the top. If I was a betting man, I'd take the Cougs plus the 17 all the way to the bank. USC 31, WSU 24. How we got here: Washington is flying high right now, fresh off a stunning comeback upset of UCLA last weekend at home. The Huskies outscored the Bruins 22-3 in the second half -- including 15-0 in the fourth quarter -- to give the UW faithful reason to believe that this team just might be able to pull off three more wins and sneak into its first bowl game since the 2002 Sun Bowl. Isaiah Stanback, a frequent target of Husky fans' ire, seems to be getting better with each game; he, without a doubt, was the difference against UCLA, throwing for 202 yards and three touchdowns while rushing for another 46 yards. Make no mistake: This is a game the Huskies would have puked away in the past. Arizona, meanwhile, has to be both encouraged and discouraged by last week's performance. Encouraged by the fact that the game was so close for so long, but discouraged that sophomore quarterback Willie Tuitama just doesn't seem to be able to get that cannon arm untracked. After a spectacular freshman season, Tuitama has been pedestrian, throwing just two touchdowns against four interceptions. He'll be looking to get it rolling against a UW pass defense that had been thought to be pretty weak, but only gave up 187 passing yards to the Bruins. Key matchup: I don't know of any other team in the country whose success or failure is more determined by just one player. Everything the Huskies do -- or don't do -- rides on the arm and legs of Stanback. Period. If he plays well against a defense that was good enough to beat USC for most of last week, then the UW has a chance. If he reverts back to the inexplicably poor decisions that have cost the Huskies so many times in the past, look out. Because when he makes mistakes, they're not just little mistakes. They're colossal ones. Prediction: For the reasons just mentioned, I wouldn't bet on this game if my mortgage depended on it. In my mind, Stanback is still just way too unpredictable, and I don't see the Huskies winning any games this year (save for maybe Stanford) that Stanback doesn't play well in. That said, I think Arizona's offense is pretty bad, and I think that's the difference. Washington 17, Arizona 14.